How to Cite This Chapter: Agarwal A, Adachi JD, Samborski W, Goncerz G. Fibromyalgia. McMaster Textbook of Internal Medicine. Kraków: Medycyna Praktyczna. https://empendium.com/mcmtextbook/chapter/B31.II.16.21 Accessed April 19, 2019. Macfarlane GJ, Kronisch C, Dean LE, et al. EULAR revised recommendations for the management of fibromyalgia. Ann Rheum Dis. 2017 Feb;76(2):318-328. doi: 10.1136/annrheumdis-2016-209724. Epub 2016 Jul 4. Review. PubMed PMID: 27377815. Wolfe F, Clauw DJ, Fitzcharles MA, et al. 2016 Revisions to the 2010/2011 fibromyalgia diagnostic criteria. Semin Arthritis Rheum. 2016 Dec;46(3):319-329. doi: 10.1016/j.semarthrit.2016.08.012. Epub 2016 Aug 30. PubMed PMID: 27916278. Fitzcharles MA, Ste-Marie PA, Goldenberg DL, et al. Canadian Guidelines for the diagnosis and management of fibromyalgia syndrome. Canadian Rheumatology Association. https://rheum.ca/wp-content/uploads/2017/11/2012CanadianFMGuidelines_17August2012.pdf. Published August 2012. Accessed July 12, 2018. Fibromyalgia (FM) is a pain syndrome of unknown etiology manifesting as chronic widespread musculoskeletal pain that is frequently accompanied by fatigue and multiple somatic and psychosomatic complaints. FM is 8 times more common in women than in men. It primarily affects white women between 35 and 55 years of age. Symptoms of FM include chronic widespread muscle and joint pain generalized to multiple body regions, chronic fatigue, cognitive symptoms, sleep disturbances, headaches, lower abdominal pain or cramping, and depression. Some rheumatologists question the concept of this disease. FM is commonly a chronic condition, and it is not typically degenerative or life-threatening. It is often associated with a high degree of disease burden, with few significant changes over time in the majority of patients. Complete remission, with full resolution of chronic pain, is rare. No biochemical or radiographic investigations are diagnostic of FM. Diagnosis is made primarily on the basis of the clinical picture. 1) Widespread pain index (WPI) (see Appendix) ≥7 and symptom severity scale (SSS) (see Appendix) score ≥5 or WPI 4 to 6 and SSS score ≥9. 2) Generalized pain (pain in ≥4 of 5 regions, including left and right upper and lower regions and the axial region; see Appendix) must be present. Jaw, chest, and abdominal pain are not included in the generalized pain definition. 3) Symptoms have been generally present for ≥3 months. The new diagnostic criteria do not include a precise assessment of tender points (Figure 1) and do not take into consideration secondary FM, which may occur in patients with other rheumatologic disorders. A diagnosis of FM may be valid irrespective of other diagnoses and it does not exclude the presence of other clinically important conditions. Unlike previous guidance regarding diagnosis, the new criteria have been standardized for both patients and health-care providers to encourage uniformity. 1. Rheumatologic diseases: Rheumatoid arthritis, systemic lupus erythematosus, polymyalgia rheumatica, myositis, myopathies, ankylosing spondylitis. 2. Neurologic disorders: Chronic neuropathic pain. 1) The recommended nonpharmacologic therapies are aerobic and strengthening exercises. Other suggested treatments that may be tried include cognitive behavioral therapy, acupuncture and hydrotherapy, meditative movement therapies (yoga, tai chi, qigong), and mindfulness therapy. Authors of the European League Against Rheumatism (EULAR) guidelines suggested against the use of biofeedback, hypnotherapy, and massage therapy. 2) Suggested pharmacologic treatments that could be tried for several weeks include low-dose amitriptyline (10-50 mg/d),Evidence 1Weak recommendation (benefits likely outweigh downsides, but the balance is close or uncertain; an alternative course of action may be better for some patients). Moderate Quality of Evidence (moderate confidence that we know true effects of the intervention). Quality of Evidence lowered due to imprecision and risk of bias and increased due to effect size. Moore RA, Derry S, Aldington D, Cole P, Wiffen PJ. Amitriptyline for fibromyalgia in adults. Cochrane Database Syst Rev. 2015;7:CD011824. doi: 10.1002/14651858.CD011824. duloxetine or milnacipran (serotonin-norepinephrine reuptake inhibitors [SNRIs]), tramadol, pregabalin (150-600 mg/d), and cyclobenzaprine (1-40 mg/d). The EULAR guidelines issued a strong recommendation against the use of growth hormone and sodium oxybate and suggestions against the use of capsaicin, monoamine oxidase inhibitors, nonsteroidal anti-inflammatory drugs, glucocorticoids, and selective serotonin reuptake inhibitors (SSRIs). No recommendations were issued regarding cannabinoids and antipsychotics. Figure 1. 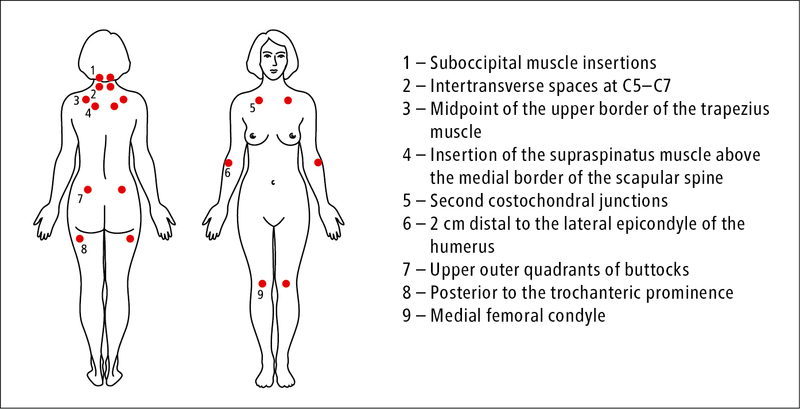 Tender points in fibromyalgia (no longer part of the diagnostic criteria). The widespread pain index (WPI) corresponds to the number of areas in which the patient had pain in the preceding week. Assessed areas include the left upper region (jaw, shoulder girdle, upper arm, lower arm), right upper region (jaw, shoulder girdle, upper arm, lower arm), left lower region (hip, upper leg, lower leg), right lower region (hip, upper leg, lower leg), and axial region (neck, upper back, lower back, chest, abdomen). Scores range from 0 to 19. 1) The severity level of fatigue, waking unrefreshed, and cognitive symptoms, measured on a 0 to 3 scale. 2) The sum of headaches (0-1), pain or cramps in the lower abdomen (0-1), and depression (0-1) that the patient had in the previous 6 months. The SSS is a sum of 1) and 2). The final score is between 0 and 12.